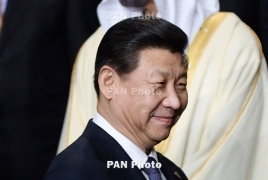 PanARMENIAN.Net - Chinese President Xi Jinping offered the prime minister of deeply indebted Greece strong support on Saturday, May 13, saying the two countries should expand cooperation in infrastructure, energy and telecommunications, Reuters reveals. Xi told Prime Minister Alexis Tsipras that Greece was an important part in China's new Silk Road strategy. "At present, China and Greece's traditional friendship and cooperation continues to glow with new dynamism," China's Foreign Ministry cited Xi as saying. Cooperation in infrastructure, energy and telecommunications should be "deep and solid", Xi added, without giving details. Tsipras is in Beijing to attend a summit to promote Xi's vision of expanding links between Asia, Africa and Europe underpinned by billions of dollars in infrastructure investment called the Belt and Road initiative. Greek infrastructure development group Copelouzos has signed a deal with China's Shenhua Group to cooperate in green energy projects and the upgrade of power plants in Greece and other countries, the Greek company said on Friday. The deal will involve total investment of 3 billion euros ($3.28 billion), Copelouzos said in a statement, without providing further details. China has been investing heavily in Greece in recent years. Its biggest shipping company, COSCO Shipping, bought a majority stake in Piraeus Port Authority last year under a plan to turn Greece into a transhipment hub for rapidly growing trade between Asia and Eastern Europe. China State Grid [STGRD.UL] also agreed last year to buy a 24 percent stake in power grid operator ADMIE for 320 million euros.